Find out what features can help you obtain efficient collaboration within your company. The process overview is the first thing you see upon accessing the process page. It contains the most important information about the process. This information is clearly set out in text form. As a process user with no previous modeling knowledge, you will still be able to understand the process. You can see the process description as well as the attachments added. 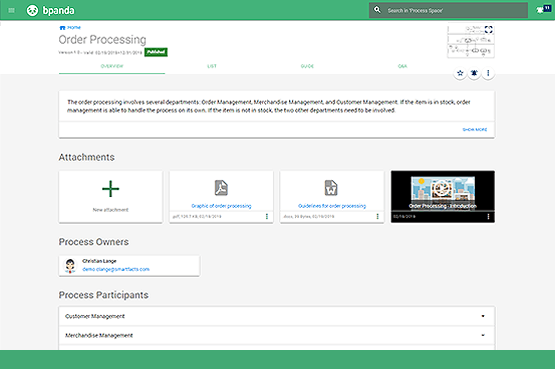 You can also get an overview of who the process owner and participants are so that you can tell who is participating in the process and who is responsible for it. This concise information gives you a glimpse into the aspects of the process relevant to you. The guide takes the process user through the process diagram step-by-step. You can view the process and there is also relevant information in text form about the individual process steps. The guide navigation enables both linear progression of individual process steps and decisions can also be cycled. 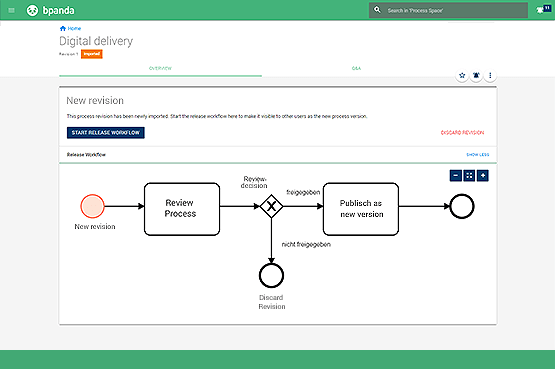 This gives you a glimpse into your company’s process flows without needing any previous knowledge of Business Process Model and Notation (BPMN). This is the perfect place to start if you want to quickly read and understand processes. Textual process description is the simplest way to document your process flow whilst taking the first step towards a process-oriented company. It is perfect for simple, less complicated processes and modeling novices with no previous BPMN knowledge. Thanks to its pragmatic approach, it means that anyone in the company can get started straight away and create their process steps on their own. This means that the company’s processes are clear and traceable, even throughout various different departments. 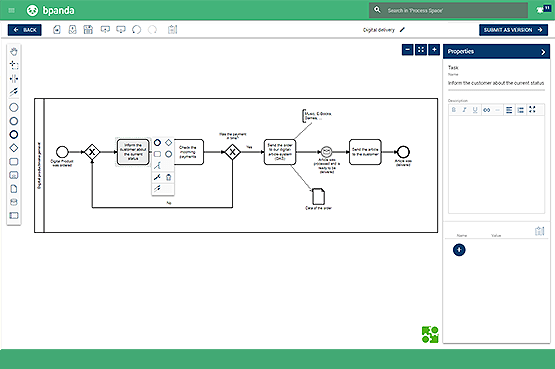 Using the happy path editor to create processes is more than simply typing a description of the process; it enables documentation of BPMN-compliant processes. It is automatically created by entering information into a table editor. Regardless of whether you’re a first-time user or occasional modeler, you can benefit from the easy-to-use happy path editor. You can use the editor to create your own process models, without the need for training expenses or previous knowledge. The editor can reduce the workload of even a modeling expert. Perfect processes that have been created quickly and easily using the happy path can then be extended and more detail added to them in the Modeler. This allows you to be flexible and ensures smooth operation. As a modeling expert, you can use the integrated Modeler for easily creating more complex processes, using the fundamental notation elements of Business Process Model and Notation (BPMN). You can use all elements you are already familiar with, such as events, conditions and decisions. This enables you to easily model alternative process steps. You can also use the Modeler to quickly and easily make changes to processes or extend them. It can also be used on mobile devices so you can document your company’s processes anytime and anywhere. Processes are not necessarily applicable. This means that it is worthwhile discussing them to make them better. Processes in bpanda have to go through a release workflow before they can be published. This workflow can be tailored to suit the customer’s needs. You can discard the entire release process for a process version if e.g. the version has become obsolete. The process owner can start the release process for an imported or submitted process version. They can also control process reviews before they are published for the whole company to view. This ensures that published processes meet the necessary quality requirements and that their content is correct. Release workflows are essential for companies who wish to implement regulatory specifications in their operative day-to-day business. A review is a basic part of the release workflow for new process versions. As process owner, you can specify review participants to give their expert opinions about the process. It is their job to assess the process and its content and give you feedback in the form of a comment. You can use the process to add comments and hold a discussion between multiple participants. A review provides a release recommendation for the process version. This promotes cross-team collaboration and all sources of knowledge from those involved in the process can be brought together to document your company’s workflows. You can ask any questions you may have about a process in the Q&A section. You can also find answers to questions other people have already asked about the process here. 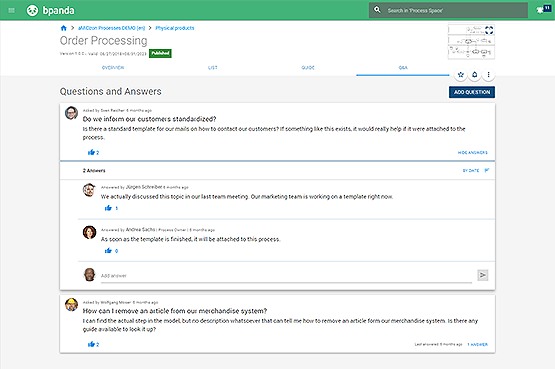 Knowledge about the process is pooled in one location in the form of questions and answers and can be viewed by all users with access to the process. Sharing the knowledge from within the company takes the load off the process owners and allows the process participants themselves to answer any questions that may arise. This keeps extensive research efforts to a minimum. All members of the company participating in the process will be motivated to share their knowledge and experience with their colleagues throughout the different departments. Process owners can create a job for all currently-valid and released processes. This job reflects a progression of tasks and can be carried out once or multiple times. bpanda guides all process participants through the process step-by-step. The flow is also visualized so everyone knows who carries out which process step. This means that responsibilities are clearly regulated and transparent, even throughout various different teams. This then leads to seamless collaboration and the fact that everyone in the company can see the log also promotes this fact. Process steps can be skipped or new ones added within the framework of Jobs, which allows you a glimpse into actual workflows. This enables both transparency and significant potential for optimizing workflows. Notifications always keep you up-to-date with your processes. This information always keeps you up-to-date with new changes that are relevant to you. The process map is used as a graphical entry point into the process landscape. It gives you an overview of which processes are running in the company and can also be used as a navigation help. You can use the search feature to quickly and easily search the process space. The search already starts suggesting search words as soon as you start typing. You can then filter the results. The organization structure is shown as a hierarchical list and shows you a structured view of your company’s organizational units. 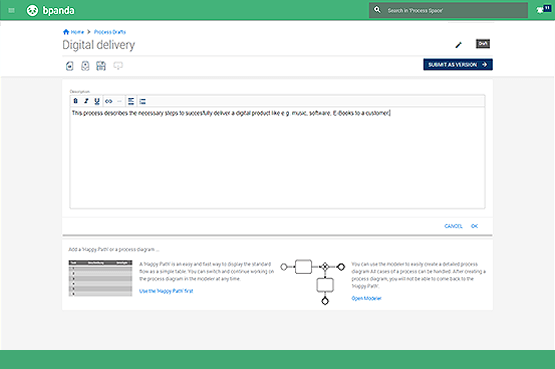 You can link lanes with processes to make processes within your company even easier to understand. Set up bpanda to suit your CI specs and take advantage of the flexible language settings for global use. This encourages user acceptance throughout the entire company. All changes made to a process are stored as different revisions. This ensures process traceability of not only the current status but also of the version history for both the process owner and all participants.